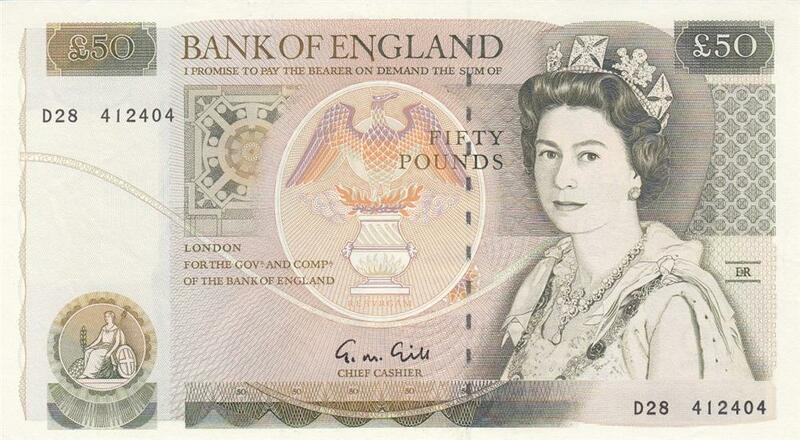 The first issue of notes with historical figures were known as the “D series,” and the last of this set was the £50 note, in use from 1981 to 1996. 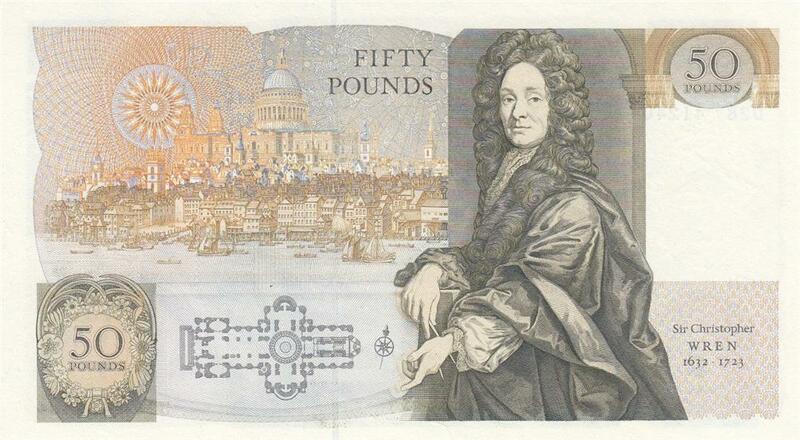 It featured the esteemed architect Sir Christopher Wren. Obverse: Portrait of Queen Elizabeth II. Reverse: Portrait of architect Sir Christopher Wren and Wren’s most well known work, St. Paul’s Cathedral, with both a landscape picture and a floor plan. Sir Christopher Michael Wren PRS (20 October 1632 – 25 February 1723) is one of the most highly acclaimed English architects in history. He was accorded responsibility for rebuilding 52 churches in the City of London after the Great Fire in 1666, including his masterpiece, St. Paul's Cathedral, on Ludgate Hill, completed in 1710. The principal creative responsibility for a number of the churches is now more commonly attributed to others in his office, especially Nicholas Hawksmoor. Other notable buildings by Wren include the Royal Naval College, Greenwich, and the south front of Hampton Court Palace. The Wren Building, the main building at the College of William and Mary, is attributed to Wren. It is the oldest academic building in continuous use in the United States. Educated in Latin and Aristotelian physics at the University of Oxford, Wren was a notable astronomer, geometry, and mathematician-physicist, as well as an architect. He was a founder of the Royal Society (president 1680–82), and his scientific work was highly regarded by Sir Isaac Newton and Blaise Pascal.